Tudor Place Historic House and Garden in Georgetown DC was one of the first national historic sites in our nation. Boasting such residents as Martha Washington's granddaughter, this neo classical home has all the grandeur of many of the district's many mansions, but is situated on six quiet acres high above the Potomac River. Since it was built in 1816, the surrounding neighbor now obscures this view, but the extensive gardens are equally as scenic and offer a quiet retreat from the busy streets just a few blocks away. This pastoral retreat in the heart of the city offers many options for your wedding or event. Venue locations onsite include the outdoor garden areas: East Lawn, Bowling Green, and South Lawn, and the indoor 1867 Victorian Gothic Dower House, the Pierce-Arrow Garage meeting room. Each with it's own unique and one of a kind backdrop, you are sure to find the one you are looking for at the estate. 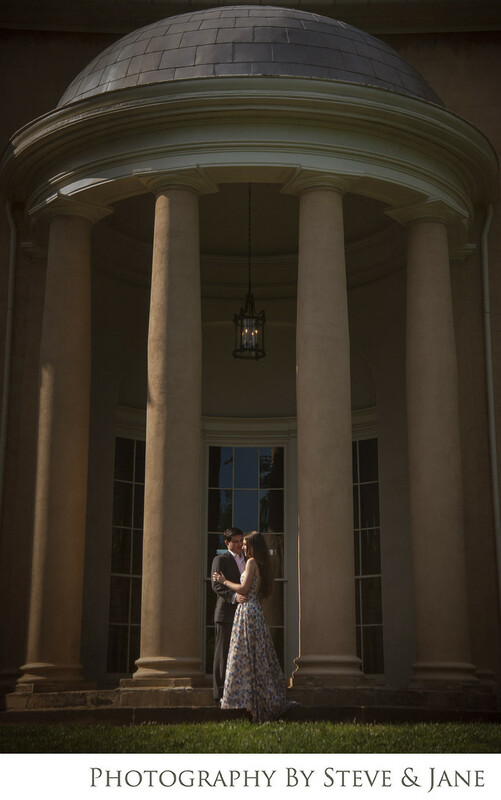 This national landmark also offers elopement packages that accommodate you, your fiance, and up to 25 guests for an hour. Spilled Milk, one of DC's most sought after caterers is on the preferred vendor list. With their unique spin on upscale yet homey cuisine, your guests will leave your event happy and well fed. The event staff at Tudor Place is dedicated to making sure each event is perfect and runs smoothly for all of their wedding clients making it one of the best and smartest choices for a wedding venue in the city.